I've received two e-mail message this week asking for a recommendation to control native Milkweed Tussock Moth caterpillars (Euchaetes egle) feeding on their namesake host. The senders were well-meaning Monarch Butterfly (Danaus plexippus) enthusiasts who were concerned the tussocks were eating the monarchs out of house and home. However, native milkweed tussock moths have the same inalienable food rights as monarchs. Royal sovereignty should not rule the distribution of plant host resources! Of course, I do understand the basis for lepidobigotry. Monarch butterflies are beautiful insects and their plight remains uncertain. However, good intentions can be taken too far. Here is a strident blog headline I found while doing some background research for this report: "Stop Milkweed Pests from Ruining Milkweed for Monarchs." I can't be deny that milkweed tussock moth caterpillars are ravenous feeders. There are two generations per season and they are sometimes a serious competitor with monarchs. The tussocks also have another leg(s) up on monarchs: they can feed and develop on other members of the dogbane family (Apocynaceae). All instars feed side-by-side in groups and a single colony can rapidly consume entire leaves leaving only the veins. In fact, high populations can out-devour even the most voracious monarch caterpillar. However, milkweed tussock moth caterpillars rarely produce heavy defoliation. If the caterpillar populations appear to be out-of-hand, they can be easily managed by exploiting their feeding behavior. Use a gloved had to apply the digital smash-and-smear control method to the caterpillar colonies, or clip the infested leaves and do the "caterpillar stomp dance." On the other hand, you could just leave them alone to observe and learn. I'm particularly partial to the ugly duckling story played out as the tussock moth caterpillars develop. Most pictures posted online show the colorful late instar caterpillars such as the one appearing at the beginning of this report. Their striking black and orange color motif is responsible for the alternate common name of "milkweed tiger moth." Early instar caterpillars represent an ugly duckling stage. The small, light yellow caterpillars have no discernable markings. With black head capsules and wispy white hairs, they have been described as "non-descript;" an ignoble label. Adult moths also lack eye-candy luster; their buff-colored wings simply don't compare in beauty to the flashy monarchs clothed in orange and black finery. The colorful late instar milkweed tussock moth caterpillars are actually advertising their chemical defense strategy. Like monarch caterpillars and many other milkweed-herbivorous insects, the tussock moth caterpillars dodge predation by accumulating in their flesh the alkaloid toxins, called cardiac glycosides (cardenolides), which are concentrated in the milkweed's sap. As with other insects that feed on milkweeds, including monarchs, late instar tussock moth caterpillars advertise their toxic character through splashy coloration; a twist to the old axiom that "you are what you eat." I support monarch recovery. However, we should embrace all native insects with equal affection; I mean this figuratively since tussock moth caterpillars have defensive hairs. 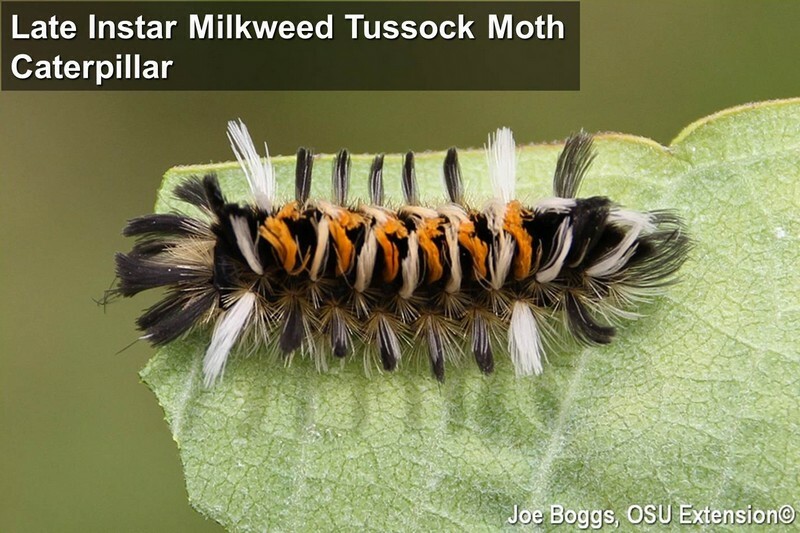 The tussock moths should enjoy the same natural born rights to milkweeds as monarchs. The bottom line: liberty, equality, and fraternity for all insects that you may find sharing milkweeds with monarchs.